As I woke up on the morning of the 25th I was confronted by the news I had feared after reading that Pandit Bhimsen Joshi had been hospitalized a few days earlier. The legend of Indian classical music had finally succumbed to multiple organ failure 11 days before his 89th birthday. I know it is cliché to say so but without a doubt with his passing away an era does threaten to come to an end. As many have pointed out, Pandit Joshi truly was a Gharana of his own and there are only a few of his generation left. A generation that redefined Indian classical tradition for our age. When I first heard him singing the Kaunsi Kanada many years ago I was transported to another world and time as he gave expression to hundreds of years of tradition. The quality of his voice and perfection of delivery combined with a deep sense of real bhakti has endeared him to people all over India and the whole world. For me personally he was and remains one of the greatest singers of all time in any field of music. It is said that Joshi decided to become a singer when as a child he heard a recording of a thumri by Abdul Karim Khan. Soon after at the early age of 11 he ran away from home and traveled to Bijapur to find himself a master who would become his teacher and initiate him into the secrets of the art. Although born in the state of Karnataka, the stronghold of South Indian classical styles, he became the beacon of North Indian classical music under the tutelage of Rambhau Kundgolkar alias Sawai Gandharva who agreed to be his guru in 1936. Before meeting his master he also spent time studying in Gwalior, the traditional seat of learning for classical musicians in India. Eventually by travelling widely and learning from many different people along with his prime guru he reached outstanding musical heights. Be it a thumri, bhajan or a full fledged raga Bhimsen Joshi gave it a dimension and depth that made him a genius in his field. The first time Joshi took to the stage as a performer was in 1941 at the age of 19 and released his debut album that consisted of devotional songs with HMV the next year. In 1943 Joshi made a career move and picked up his bags again and headed towards Bombay where he became a well sought after radio artist. Since then his career has been one of distinction and utter artistic integrity. The prices he has won are too numerous to mention and in any case the number of hearts and minds he has captivated his music must be the biggest achievement of his life. I hope the coming generations will continue to listen and study his style of singing and that his legend lives on. We will all sorely miss his presence and think of him with affection for the rest of our lives. He was cremated at Vaikunth Crematorium in Pune with full state honors. 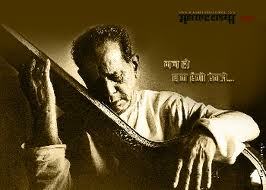 Buy recommended collections of music by Bhimsen Joshi at the Amazon powered Finndian Store.